My Bids are High, Why am I not Getting Impressions? We’ve been there. You start your campaigns up for a new product. Wait 48 hours for the data to show in Amazon and your ads haven’t shown! What a buzzkill. It’s important to understand what Amazon is thinking and how you can make sure your ads are getting shown. My goal is to help you start getting better results from your PPC faster than free two-day shipping. When Amazon determines whether to show your ad, it considers these factors. Bids need to be high enough. The CPC for some keywords may be surprisingly expensive. The suggested bid range, that Amazon shows, tells you what other ads are having to bid to have their ad showed. If your product is new, you probably need to bid higher. Make sure you’re not actually underbidding without realizing it. Second, Double Check Your Budget! Make sure your budget isn’t too low to start getting traction. For example, if you start with the minimum budget of $1 and the average CPC for your type of keywords is $1.50. Amazon is barely going to show your ad in order to try to not go over your budget. Make sure your budget is enough to afford at least a few clicks every day. Amazon wants to show Amazon visitors the most relevant ads. Even if you are willing to pay a lot of money for your ad to show, Amazon does not want to show an ad that is unlikely to result in a purchase. If you’re not getting impressions, it’s likely a relevancy issue. Assuming you’ve already built your listing, the first step is to check if Amazon is recognizing your product as relevant for your target keywords. We call “indexed” for a keyword. Remember that it typically takes up to 48 hours in order for Amazon to index you for a keyword. Wait 48 hours after creating your listing or adding a keyword before checking if the indexing worked. To check if you are indexed for a specific keyword, type in the ASIN of your product and keywords into the Amazon search bar. You can include multiple keywords at the same time. This technically isn’t 100% accurate, but it’s a pretty good indicator. Place the most important keywords in your listing, put other related keywords as backend keywords. When you are bidding on keywords in PPC, those same keywords should be in your listing (in order of importance, title, bullets, description) or your backend keywords (in the “search terms” section of the keyword tab you use to edit your listing). The keywords in your listing are what customers will see and they have a lot more weight when Amazon is determining relevance. Putting other keywords as backend keywords (typically words that don’t directly describe your product but are somewhat related to your product). Once you update your backend keywords, wait 48 hours and check if your keywords are indexed. If after multiple attempts, you still can’t get indexed for a specific keyword, just take it out of the backend keywords. This usually means that Amazon does not think it is relevant enough to your other keywords and refuses to budge. Often, if you break just ONE of these rules, Amazon won’t index you for ANY of your backend keywords. Once you’re indexed for keywords, you should start to get some impressions for those keywords. If Amazon shows you and you get very low click-through-rates. Amazon will show you less and less over time. That’s okay though, for the keywords where you get some sales, Amazon will want to show you more! Go through these steps, and you should start getting impressions soon! 1. Always Remember The Time Lag! Remember that your data showing in the campaign manager is not complete for up to 48 hours. If you just started a new campaign or are looking at stats from yesterday or today, the data you’re seeing in the campaign manager is incomplete. You may not be seeing impressions, clicks, or sales yet, even though they are occurring. Your keywords may be overlapping. For example, if two of your keywords are “cooler” and “blue cooler” they may all get picked up under “cooler.” Unnecessary keywords will often not show impressions in your reports because they are getting picked up by another keyword. I haven’t seen this confirmed from Amazon yet, but there are rumors that phrase match keywords are given more impressions than other match types for products without a sales history. McKay Salisbury is the CEO of Five Star Commerce, a “freelancer team” in the Salt Lake City area providing Amazon consulting and other seller services. 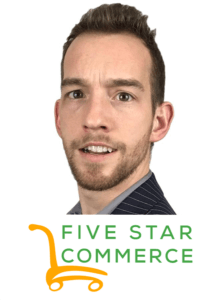 Five Star Commerce combines the benefits of working with a freelancer and an agency with Amazon experts/project managers, and mid-level workers all sharing the most efficient processes, best practices, seller strategies, and a single physical location. All Five Star Commerce services are available for simple hourly rates. McKay has been featured on 97.1 ZHT, the Utah Fan Club podcast, and contributed to the FreeeUp blog.